Infinity is weird: what’s bigger than big? The second in what will (probably) be a three-part series of posts on the size of the infinite, as described in mathematical set theory. The first post can be read here. When I was young, there was a series of jokes of the “what’s grosser than gross?” variety. Imagine the grossest thing you can, and then ask: what’s even grosser than that? I don’t really want to talk about the grossest things I can imagine — learning about science and nature has exposed me to more grossness than I ever wanted to know –but on a related note, we can ask the question: what is bigger than big? Or, to put it in more suggestive language, what is bigger than infinity? If this were the end of the story, it would be supremely unsatisfying, and hardly even mathematics*, since the conclusion seems to be that there is one size of infinity, and any manipulation of it simply returns the same size infinity. But this is not the end of the story! We can demonstrate that there is a bigger infinity than , and it has been hiding in plain sight, so to speak, in even some of the most elementary mathematics. But how big is the set of numbers that lie between 0 and 1? There are clearly at least an infinite amount of them, because the set of fractions is infinite, and all of these points lie within the range. In order to answer the question deeper, we should review how we compare the sizes of sets, in a slightly revised version of the argument in the last lecture. Suppose we have two really big piles of M&Ms, and we want to make sure that the two piles are of equal size. The most obvious way to do this is to count the number of M&Ms in each pile, and compare the resulting numbers. However, for a really big stack, this is inefficient: we end up counting two really big piles, and there exists the very likely possibility of making a mistake. Furthermore, we usually don’t care about the actual number of M&Ms in the pile, only that the two sets are equal — by counting, we’ve gathered information we didn’t even want. A more efficient strategy is pictured below. Instead of counting each pile, we simply line them up side by side, and determine if there is a perfect “one-to-one” match between the two piles. This is a better option for two reasons. 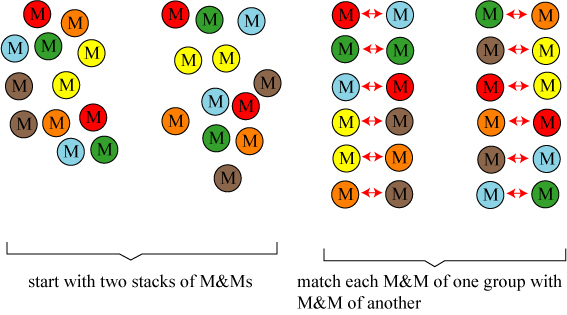 First, we effectively do half as many mathematical operations, since we do one “matching” for each pair of M&Ms. Second, we don’t need to worry about keeping track of the total number of M&Ms at all, only whether every M&M of one pile has a partner in the other. This second advantage is important for working with infinite sets. Since we can’t “count” an infinite number of objects, the only way we can compare the sizes of two different infinite sets is to see if we can make a similar “one-to-one correspondence” between elements of the sets. for any integer , are also the same size as the set of natural numbers. All of these are what are known as countable infinities, since they can be arranged in order, and since there is no finite number that can be used to describe their size, it was given the label by Georg Cantor, who first explored the subject. Now we turn our attention to the set of numbers between 0 and 1. These numbers form what we call a continuum: there is a continuous range of numbers that lie between 0 and 1 without any “gaps.” In other words, there is a number that corresponds to every point on the line between 0 and 1. It is potentially a bit trickier to determine the cardinality (size) of such an infinite set, but we can compare different size continuums via a geometrical argument. For instance, it is easy to demonstrate, as shown in the figure below, that the size of the line segment between 0 and 1 is equal to the size of the real numbers, i.e. all numbers that lie between -∞ (minus infinity) and ∞ (infinity). To do so, we take the line segment of points between 0 and 1, and fold it, producing a “kink,” and place it above the infinite real line as shown. We then draw another line (shown in red) between the point above the kink that passes through both the line segment and the real line. For every point that the red line hits on the real line (in blue), there is a corresponding point (in red) on the line segment. As the red line gets more horizontal, it intersects the real line further along its length, in principle hitting it at “infinity” when it hits the point 1 on the line segment. This shows geometrically that there is a one-to-one correspondence between points on the line segment and those on the infinite real line! The set of points on the finite line segment is the same size as the set of points on the infinite line. We refer to all sets of this type as the continuum, and label the size of the set as . But is the size of this set the same as ? It would seem that there are two possibilities: either they are the same size, in which case we should be able to find a one-to-one correspondence between the natural numbers and the continuum, or they are of different sizes, in which case we should be able to show that the one-to-one correspondence is impossible. In what must be one of the most remarkable and beautiful proofs in all of mathematics, Georg Cantor showed that the latter case is true: the continuum is a larger infinity than the set of natural numbers! Seems simple enough, right? Now Cantor constructed a new number, and let its first digit equal anything except , its second digit equal anything except , and so forth. 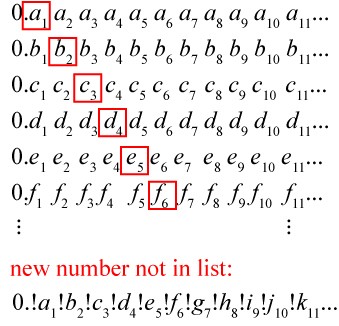 The result is that the new number is defined by avoiding the “diagonal” digits on the list. This new number, however, does not exist in our countable list — it has one digit different from every member of our list! We could try and add the new number to the beginning of the countable list, but we could then use the diagonalization method to construct another number that is not on the list. This process can be continued infinitely, without any change: it is therefore impossible to put the continuum into one-to-one correspondence with the natural numbers. Because there are more elements to the continuum, we can say that the continuum is an infinite set of larger size than the natural numbers. Symbolically, we may say that is larger than ! The implications of this result are huge. For one thing, it is worth noting that the real numbers, with cardinality , contain algebraic numbers as a subset, which in turn contain the rationals as a subset, which in turn contain the natural numbers as a subset. In diagram form, we can illustrate this as follows. We have already seen that the natural numbers have a size , though they are a subset of the rational numbers, which also have a size , which in turn are a subset of the algebraic numbers, which have size . But the real numbers have a size , which implies that the transcendental numbers also have a size ! What are the transcendental numbers? They are any number that cannot be written as the solution to an algebraic equation. Most of us are only familiar with a few of these numbers, such as and Euler’s number , and in fact relatively few transcendental numbers are known. But, from the arguments above, we see that the transcendental numbers are a larger infinity than any of the numbers that we usually work with. Most of the numbers we work with and encounter in our everyday mathematical calculations are a negligible subset of the complete set of real numbers! If we’re willing to accept Cantor’s proof, however, we can find even more unusual properties of this new infinity ! For one thing, we can show that the set of all points in the square with and have the same cardinality . The proof of this comes from the decimal notation of the numbers in a line segment again. The “unit square,” excluding the boundary. 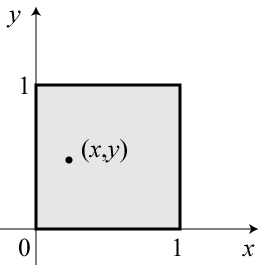 A single point (x,y) is illustrated. This is a decimal number between zero and one itself, and with a bit of thought it becomes clear that every possible number between zero and one can be constructed from the x– and y-coordinates. Therefore a two-dimensional region of space contains the same cardinality as a one-dimensional line. This argument can be extended to any finite-dimensional space. The set of points in three-dimensional space has the same cardinality as a one-dimensional line, as does a four-, five-, or N-dimensional space! We now have demonstrated two different sizes of infinity, which we have labeled and ! Are there even larger size infinities? In fact, we can prove that there are an infinite number of increasingly larger infinities! … but this will be discussed in the third part of this series of posts! * Adapting some arguments from J. Breuer’s “Introduction to the Theory of Sets” (Dover, 2006), which is also a nice introduction to the subject. 12 Responses to Infinity is weird: what’s bigger than big? 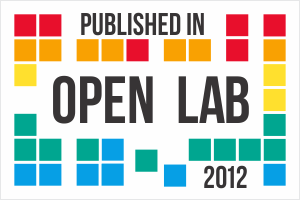 I love that you�re doing a three-part post about this topic. As you�re discussing Cantor, this seems the appropriate time to suggest the following 5-part BBC miniseries on Cantor, Boltzmann, Turing, and Godel, titled �Dangerous Knowledge.” (The ads are annoying, but the show is well-worth the occasional ad interruption.) Yes, one can pick nits with it, but overall it�s pretty decent. I apologize if I�ve suggested this to you before. I’ll respond anyway — thanks! Sorry, lose you there. 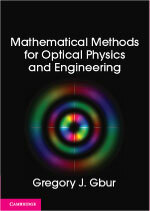 Either there is a one to one correspondence, and then it shouldn’t matter how I construct the mathematics. No matter how one define it I should be able to lift out Cantors ‘new numbers’, aside the natural numbers for example, in a one to one correspondence. And even if it logically seems to exist different magnitudes of infinities, I don’t expect it to stop that ‘one to one correspondence’, ever. So you suddenly seem to have a cat biting its tail here. No end to a one to one correspondence, at the same time as it is assumed that one infinity is bigger? Not entirely sure of what your point is, but I’ll try and answer. When you say “shouldn’t matter how I construct the mathematics,” I assume you mean writing the real numbers in decimal form. In fact, it doesn’t depend on that assumption: we can apply the diagonal argument to numbers in binary form, octal form, hexidecimal form, base 18-form, or whatever number representation we want! Furthermore, the diagonal proof is not the only proof of uncountability of the real numbers: his first proof of the result (http://en.wikipedia.org/wiki/Cantor%27s_first_uncountability_proof) relied not at all on a number representation. It just turns out that the diagonal argument is much more elegant way of demonstrating the result. Another way to understand that the real numbers are uncountable: given any two numbers between 0 and 1, no matter how close together, I can find another number that lies between them. When looking at the natural numbers, I can always identify the “nearest neighbors” of any number: for instance, 10 is adjacent to 9 and 11. However, there is no “nearest neighbor” for any real number, because for any neighbor I choose there’s always another one closer! Loosely speaking, the real numbers are so densely packed that they cannot be organized in a simple countable manner. This argument is kind of weird. 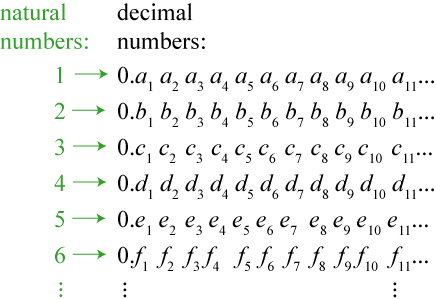 The natural numbers do in fact have two nearest numbers, but other systems that are the same size (aleph_null) don’t, at least when using the conventional ordering. The rational numbers, for example. There is no rational numbers (or set of rational numbers) that are nearest neighbors of a given number. You can always find another rational number in the interval between two others. Yet the fact that you can put them on a list does suggest that you can construct some definition of “nearness” for which its true that each rational has two nearest neighbours. So looking at the previous infinities post, it looks like using the ordering there 1 and .5 are the nearest neighbors of the number 2 (and are “equidistant from it), while numbers we think of as being closer to 2 (like 1.75) are quite a bit further, and most notably, 1.75 isn’t “between” 2 and 1. I’m not really going anywhere with this. It just seems interesting and counter-intuitive that you can take a “dense” number system and change its ordering to make it “not dense”. Yeah, that statement, which I added as an afterthought after posting, probably is more obfuscating than clarifying. I’ve taken it back out until I’ve given it some more thought. I agree with you that Cantors proof must be one of (if not the) the most beautiful proof in mathematics … I came across it several times already and it always “wows” me. You don’t even need higher math to understand it, the concept of correspondence and some logic is sufficient. Thanks for the post! I’m a little confused. It looks like the Cantor’s diagonal argument shows that a particular method of creating a one to one correspondence between the two sets will not work rather than that there is no way to create such a correspondence. I’m missing the bit where the proof reveals that in general there is no possible way to create the one to one correspondence. Help would be appreciated but in any case I found this series of posts very interesting. The trick, such as it is, is that Cantor’s argument doesn’t specify the method for attempting to make the correspondence. If any one-to-one correspondence exists between the naturals and the reals, it must involve lining up the naturals next to the reals exactly as shown, which is pretty much the definition of “one-to-one”. We haven’t even attempted to write a specific ordering, and have labeled the decimal coefficients as a1, b1, etc. In fact, we could do the same thing with any representation of the real numbers, be it binary, hexidecimal, base-105, or whatever! Cantor’s diagram therefore exhausts all possible attempts to line them up, by definition. Ah… I see. I was thinking that you could take a number line, ignore everything but the naturals, and compress it so that the line of natural numbers would be as “dense” as the reals. From there, a geometric argument similar to the one you used earlier in the post could show a one to one correspondence. I guess Cantor’s proof implies that even if there is an infinite number of naturals they can never be lined up as densely as reals.